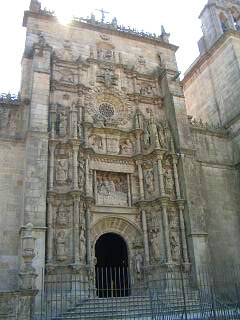 The history and presence of the "Basilica de Santa Maria a Maior" owe much to Pontevedra's long seafaring history. 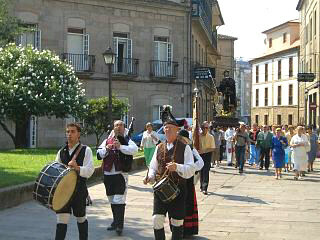 As Galicia's premier port town, Pontevedra had a large population of seafaring dependant inhabitants in the fifteenth, sixteenth and seventeenth centuries and the seafarers Guild provided the finance for this large temple. 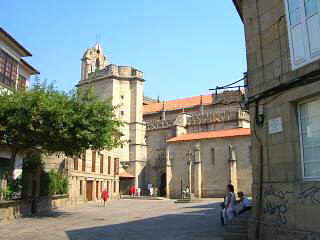 The first parts of the structure were built in the fourteenth century, but it is the detailed and complex main facade of the sixteenth century for which the Basilica is best known (photo to right). This part of the building was envisioned as a massive stone alter piece and built by "Cornelis de Holanda" and" Joao Noble". It is unusual in that it depicts not only the religious figures of antiquity, but also Spanish Kings and even Christopher Columbus. Built in 1541, this west face is slightly newer than the earlier sixteenth century facades on the north and east face of the temple, much of which is in a Gothic style. Staying on the building's west, a small part of what was once Pontevedra's town wall can be seen, and below this point is a stretch of land that leads to the river Lerez. An old Jewish quarter is also located close by and the whole area was once the main stay of the fishing community and its powerful Guild members. Viewing the "Basilica de Santa Maria a Maior" from the south, you find yourself in an attractive semi gardened square called the "Praza de Alonso de Forseca". This is an irregular and elongated plaza that has an ornamental fountain some cafes, a large and interactive "Rias Baixas" tourist office and several small mansion house buildings on it. There is also a small center piece with a seating area at its far end. It is from this position that you can get the best view of the high level Gothic detailing of the Basilica and also an appreciation of the temple's true size. During religious festivals, it is along this square that the church processions approach before entering the building itself and it is certainly from this position that you get the best view of the Gothic elements of the temple's design. 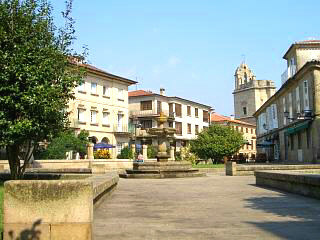 The view to the right looks down the "Praza de Alonso de Forseca" square, with the fountain in the forground and the church of Saint Maria in the background. 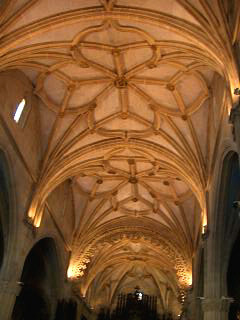 Within the "Basilica de Santa Maria a Maior", some further historic sculptural and architectural treasures await. An image of "Christ of the seafarers" dates from the eighteenth century and is to be found in the right hand nave. Three further carvings, one of Christ, one of Mary and another of Saint John, all originate from the sixteenth century and a statue of Mary and child predates them all with an origin dating from a century earlier in the fourteen hundreds. When we visited the Basilica, we were fortunate enough to follow a religious procession into the church and see a brief ceremony in progress, but the feature that impressed me the most was the central vaulting running the length of the main chapel (left). That said, it is the external facades of the building that are its main tourist attraction. The shot to the right shows the cathedrals vaulting and the one below shows a religious procession heading for the church of Santa Maria a Maior just before we approached it.